“I have given to them the glory and honor which You have given Me, that they may be one [even] as We are one,” (John 17:22 AMPC). A lot of times our prayers go unanswered, James says, because we pray “amiss” (see James 4:3). This means we pray with wrong intent or with a wrong heart. True, sometimes it might be because we have selfish motives. However, I believe that sometimes it’s because we simply don’t know the truth of what the Bible says about us – indeed, what God Himself says about us! If we really knew what God’s opinion of us truly is – how He feels and thinks about us – we would pray from a completely different perspective! One such instance is in John 17:22. In English, the glory and honor that Jesus is talking about seems to be strictly divine. It seems to mean that, somehow, we’ll be radically transformed into this glowing entity in a glorified body, perfect in every way, like Jesus in the transfiguration (see Matthew 17). Surely, we cannot achieve GLORY this side of heaven, we think. He must mean when we die, right? THAT is what God says about you! God’s own personal opinion of Jesus is that He has value – GLORY. God has a good opinion of Jesus. Well, guess what? Jesus has the SAME OPINION ABOUT YOU! He “GAVE” you this opinion, this name, this value, this GLORY in John 17:22. His personal opinion of you is that you have inherent, intrinsic worth! That means without lifting a finger, without one prayer, without one moment of doing any kind of Kingdom work at all…you have value to God…just by being you! 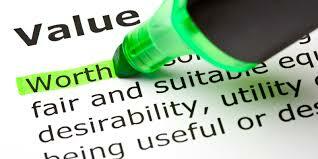 You have the EXACT SAME VALUE to God that Jesus does! You are as valuable to God in His eyes as Jesus! You are “…His prized possession,” (see James 1:18). Now, THAT should change the way you THINK about yourself! If you KNOW that God speaks that highly of you, that He THINKS that highly of you…it only stands to reason that you should think that highly of yourself. So, begin today. Begin seeing yourself as God sees you! Give YOURSELF the same value that God does! Stop listening to the enemy tell you that you are worthless, that your life has no meaning. You are every bit as valuable to God as the Savior that He sent to redeem you! Open your eyes to the truth of this, and live life worthy in your own eyes. God already sees you that way. BECAUSE YOU HAVE THE SAME VALUE AS JESUS and He gave it all in obedience to God, does this mean you need to give God your all? Yes. He gave to you His only Son, Jesus Christ, His “prized possession”. Jesus gave Himself right back to the Father. This is our model. You are God’s prized possession in this hour, giving your all back to God, not holding anything back. Today, give your most prized possession back to God. Give Him your very best offering today. You are not required to give your first born – only your FIRST FRUITS. I challenge you to give a first fruits offering today into this ministry, Spirit Fuel. This ministry gives so much to you every day. Give back to God by giving into Spirit Fuel. You will be blessed! Author Edie BayerPosted on April 7, 2018 April 7, 2018 Categories UncategorizedLeave a comment on God’s Opinion of You!